The new Pronomic CDJ-500 Full Station Double DJ CD Player offers everything to bring fat beats and party anthems to the dance floor. 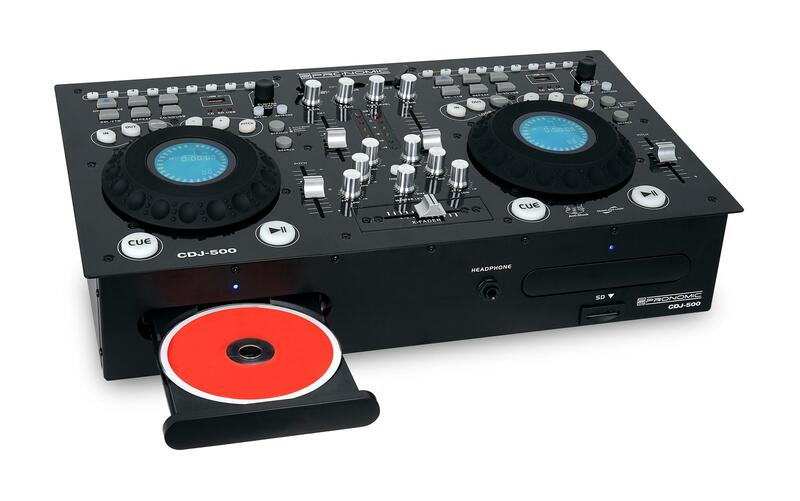 Spiked with scratching, brake and reverse effects, single and continuous mode and with the numerous input sources such as CD, USB and SD Card inputs, this fantastic DJ twin CD player offers everything necessary to bring party rooms, restaurants and other events to the boil! 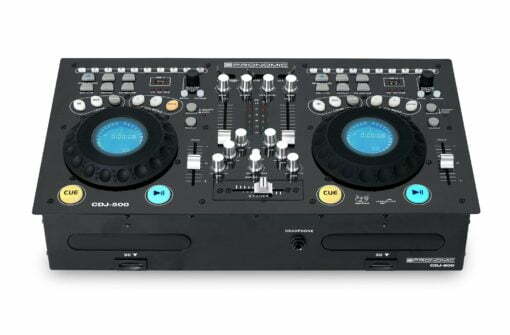 The CDJ-500 has a CD compartment, a USB slot and an SD card reader per channel. There are many possibilities to choose from whichever input medium you should choose to use. The two channels can be matched and controlled with the help of a gain, a volume control and the center-mounted level meter. Options In addition to audio and MP3 CDs, SD cards and USB sticks can also be used as audio sources for maximum flexibility. With quick access to thousands of tracks from different storage medias, you have limitless music enjoyment. To top it off, the DJ Desk has 2 phono / line inputs for external turntables and other playback devices such as smartphones or tablets. The high-quality RIAA preamps raise the input signal from connected turntables to a decent working level. The two large cue buttons allow you to jump to a specific point at any time to start each song from the perfect time-point. The cue point can be determined frame by frame with the play / pause buttons and the jog wheels. The two smooth-running jog wheels can be used in a variety of ways. As a turntable replacement, there are the possibilities to temporarily change the pitch or to install great scratching simulations. Alternatively, frame-accurate sighting of a cue with these user-friendly rotary wheels is no problem. Using the 60mm faders; a fixed pitching can be selected. 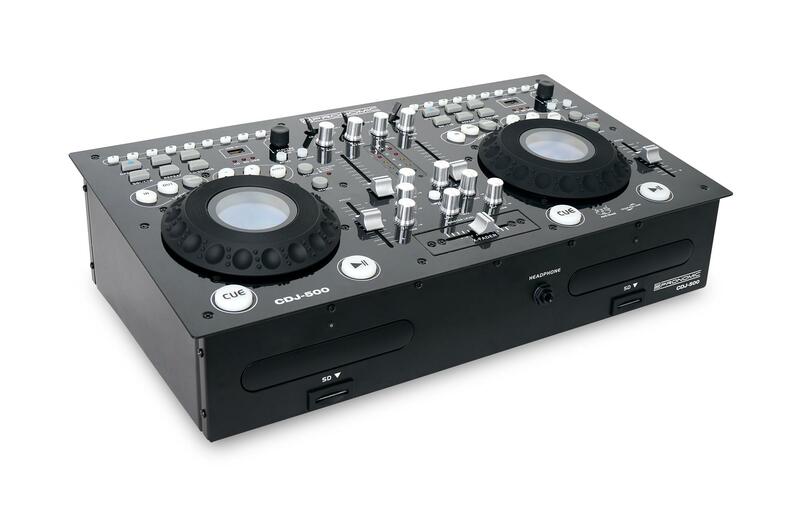 Alternatively, the two faders can be completely deactivated by a long press on the “Pitch” button. Short-term pitch bends can be created very comfortably using the “+” and “-” keys or the large jog wheels. Immediately after releasing the playback jumps back to the original speed. With seamless A / B playback, the best passages in a track can be played in continuous loop without ugly pauses; even the later start of the loop is possible at any time with the “Reloop” button. The two DSP effects “Brake” and “Reverse” are available to effectively spice up the whole mix. While in Brake mode the slow stopping and restart of a turntable is simulated. The reverse effect plays the track backwards. Especially in loop mode, you can use the 3-band EQ to create interesting filter effects that add a personal touch to your own mix. All titles on a CD or a storage medium can be selected quickly and easily via a single rotary knob. It is not only possible to search by title, but in whole folders for the next matching track. For a very fast selection there are 10 direct keys (1 – 0) available. Single or continuous play mode (in single mode playback stops after each track, in continuous mode all tracks are played in one go). The bar graph in 10 segments shows how much of the current title has already passed. Upon request, a playlist of up to 20 songs can be easily programmed. Even the best DJ needs a little break! 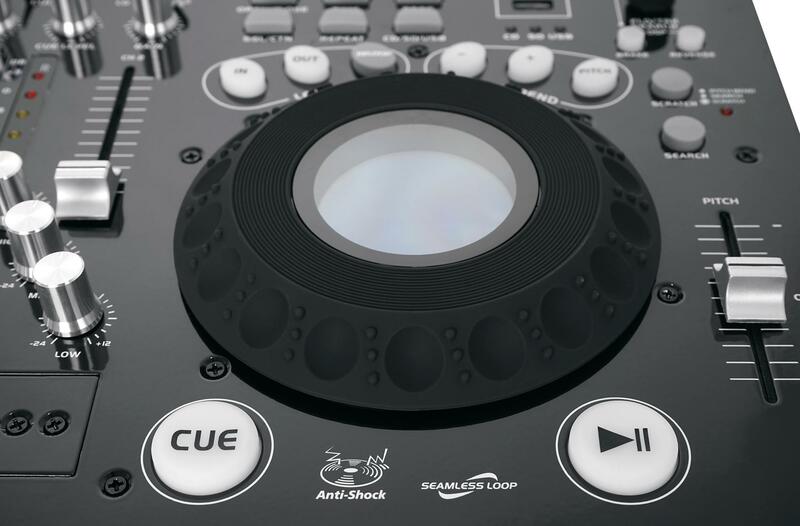 With the 45mm crossfader, not only can you blend gently between the two channels; in fader start mode, the fader automatically stops or starts the respective channels automatically! The CDJ-500 has two microphone inputs (XLR and jack) to further fuel the dancing crowd or to return lost keys and purses to their owners. The volume of the microphone channel is separately adjustable, as well as the “cue level” (ie the headphone volume). 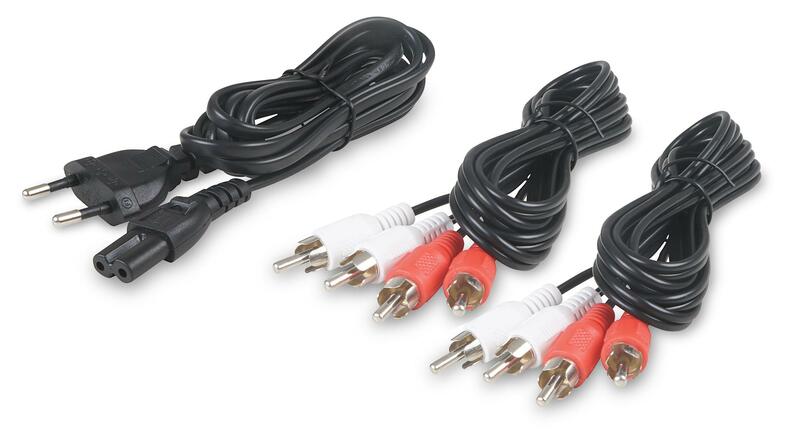 Two stereo RCA connections are used as audio outputs: an AMP-OUT for signal transmission to an amplifier and a REC OUT to record the mix of the evening, for example on a laptop.